This compact, open-frame Penn casting reel gives you the control needed to work small baits on light line, at distances you never thought possible! 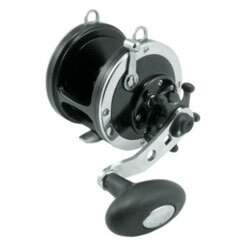 The Squall's Live Spindle/free-floating spool design, six shielded stainless steel ball bearings plus instant anti-reverse, and externally adjustable magnetic brake deliver long, accurate, tangle-free casting without sacrificing strength. Graphite frame, machined- and anodized-aluminum spool, marine-grade gears, Versa-Drag with HT-100 washers.